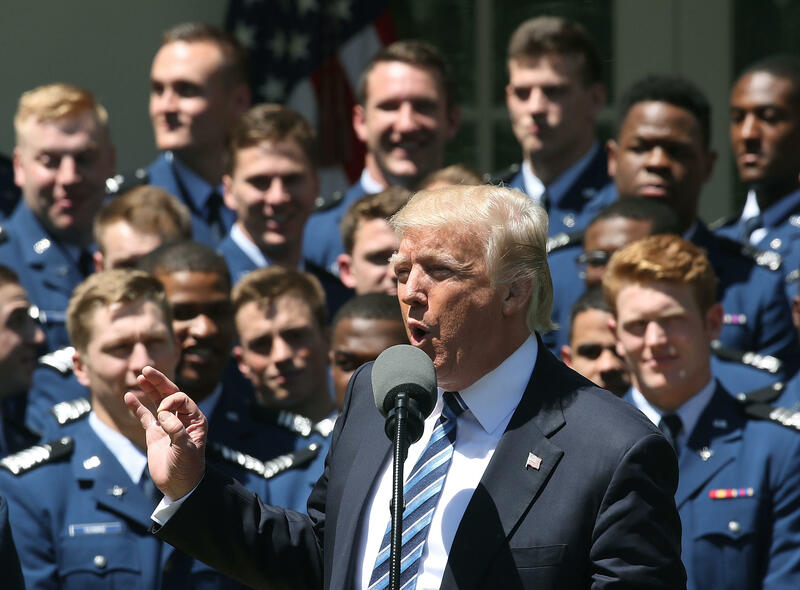 While delivering remarks at a ceremony celebrating the Air Force football team's win over Army and Navy, President Donald Trump called the latest budget deal in Congress a "clear win" for the American people after "years of partisan bickering." "This is what winning looks like, something you folks really know about," Mr. Trump quipped to members of the football team. Mr. Trump devoted much of Tuesday's remarks lauding the bipartisan budget deal for increasing military defense spending. "In our new budget and it's been a very hotly contested budget -- we have to go through a long and rigorous process, but we've ended years of painful cuts to our military and just achieved a 21 billion dollar increase in defense spending," said Mr. Trump. Mr. Trump said the "hotly contested budget" provides a $21 billion increase in defense spending, something that Mr. Trump said was achieved without "any touting like the Democrats did." "Not only did we achieve this massive and badly-needed increase in defense, but we did so without having to put in place an equal increase in non-defense spending, breaking the so-called 'parity rule' that was breaking our budget and degrading our military and that's not happening any more," added Mr. Trump. Mr. Trump continued that the core campaign promise of his will make America more safe and secure, giving service members "the tools they need and very much deserve." The president listed other line items that were included in the deal including health care resources for coal miners, funding for school choice and the financing of existing infrastructure along the border. Democrats had previously made clear that members would oppose any bill put forward that would include funding for a border wall in the package. The current bill now allots $772 million to Customs and Border Protection to back improvements as well as increase in hiring of border patrol agents and new technology. "Make no mistake -- we are beginning to build the wall and we will keep out the gang members and human traffickers that threaten our security. "Any member of congress who opposes our plan on border security is only empowering these deadly and dangerous threats," the president added.